We have owned our 2011 Keystone Cougar model 276RLSWE since it was brand spanking new. 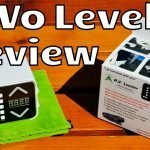 After traveling in it for 18 months, I published a full review. Now, after living in the rig as full-time RVers for six years, I thought it was a good time for a return visit. We have tons more RVing experience, and the trailer has had a decent amount of wear and tear applied to it. I’m going to go through our likes and dislikes plus list all the repairs the Cougar has required. I call it “The Good, The Bad and The Broken.” In the six years time, we have circled the US and Canada and snowbirded to the US southwest from British Columbia five times. Mileage is hard to calculate being a trailer, but I would guesstimate it’s in the vicinity if 50-60 thousand. Roughly 2/3rds of the time we connect to full hookups, and 1/3 finds us dry camping. 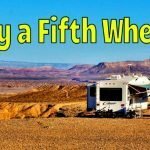 We’ve worn out 2 1/2 sets of tires and taken the rig down many rough dirt and gravel roads seeking out prime off-grid boondocking locals. So, we haven’t babied the beast at all. 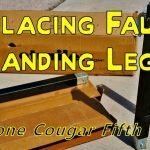 I believe we’ve given the Keystone Cougar trailer a thorough testing and hope our experience can help others as they choose a rig of their own. 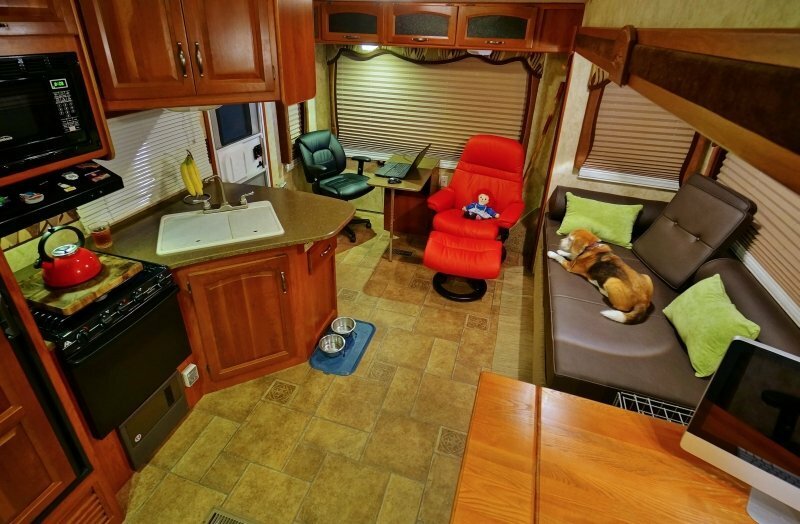 Layout – Since day one we have loved the design of our Cougar and six years of full-time living has proved it’s suited to our lifestyle. 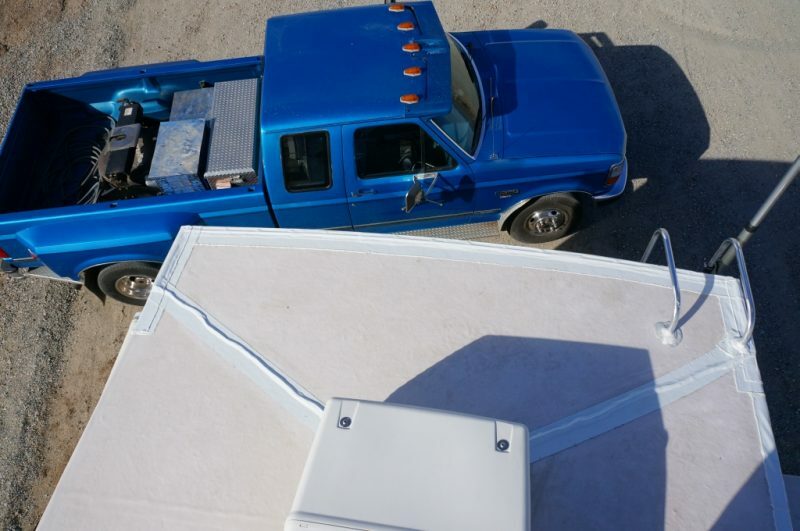 We’ve toured numerous other trailers in our size range over the years and have yet to find one we would trade for it. 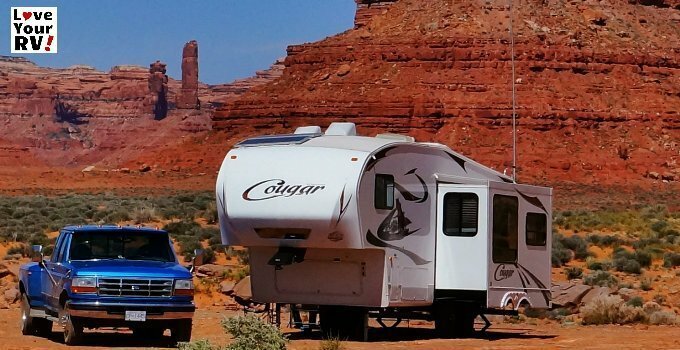 Maneuverability – At only 30 feet long the Cougar is nimble compared to the average fifth wheel these days. 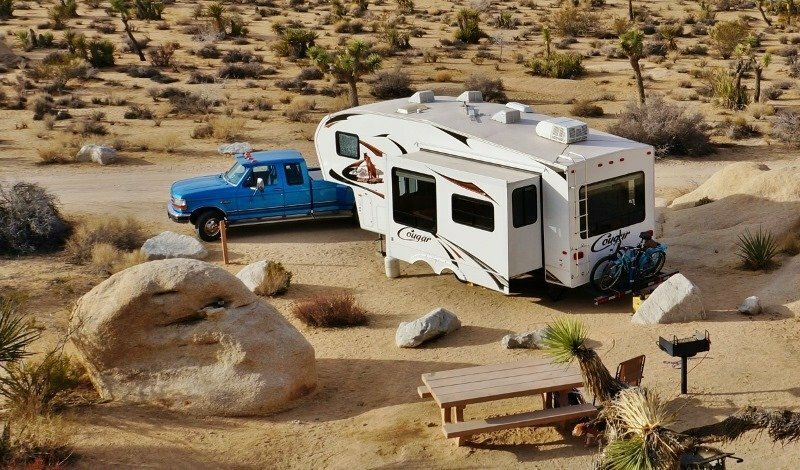 We can squeeze into tight campsites, take on curvy roads or fuel up in stations where others may fear to go. Excellent CCC – At around 3000 lbs the Cargo Carrying Capacity of our Cougar was a big selling point for me and has proved vital for full timing in a smaller sized rig. Lots of Storage Space – Keystone designers did an excellent job at packing in a ton of storage area. Love the deep pantry shelves, spacious kitchen cupboards, and large drawers. Big Picture Windows – We love the large rear and slide out windows. 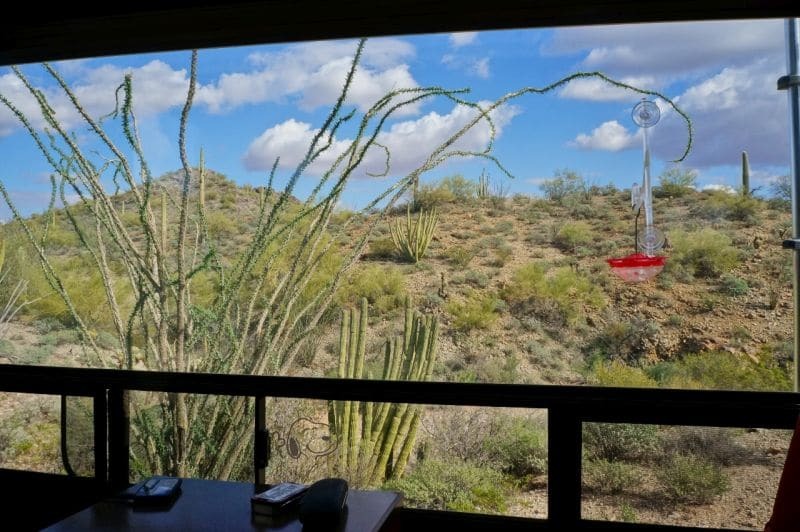 Even though they can be a negative from a heating and cooling aspect we adore the views. They open up the living area, placing us more in our outside surroundings. A big plus when stuck inside during spells of inclement weather. Solid Frame and Suspension – We have had zero frame or suspension failures (other than regular maintenance of worn out parts). I’m most impress given the mileage we have accrued and some of the extremely rough roads we’ve traveled on. Tows Beautifully – Matched with our one-ton dually truck the rig pulls pure and smooth. We get almost no chucking motion or sway and have no feeling of the tail wagging the dog. Heavy winds aren’t a concern; the Cougar handles them well. Spit Bathroom – We like the fact that the toilet is in a separate room of its own. Having the shower and sink in the bedroom area may seem odd to some, but we appreciate the extra roominess. Double Paned Windows – Love them! Not only do they insulate, but they also cut down the outside noise levels by a significant margin. Cabinetry – We like the solid cherry wood cabinetry doors and drawers faces. They’ve held up well and still look great. Counter Tops – I have to admit I was skeptical of the plastic type artificial stone countertop material. But, they have stood the test of time. Shower Head and Faucets – Flow rate of the shower head was terrible, and I hated the multiturn faucets. I’ve upgraded to an Oxygenics head and 1/4 turn taps, vast improvement. Dark Cabinets – At night many of the cabinet spaces were hard to see into, mainly the pantry and under bed storage. I’ve added inside cabinet light to help out. OEM thermostat – Trailer came with a manual slider type with a huge temperature differential. Upgraded it to a digital unit with auto heating and cooling switchover. Roof Seals – I’m not a fan of the way the Cougar’s roof is designed and sealed, especially the rear corners. Water pools there and runs down the outside corner bead. I’ve added diversion channels at the back of the AC unit and utilized Eternabond roofing tape to try and ward off any leaks. So far it’s been working. Storage Bay Door Gaskets – Cheap foam was used and is starting to breakdown already. I’m planning on upgrading to rubber gaskets shortly. 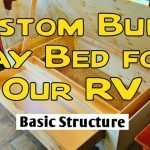 Cold Bed – Due to the lack of adequate insulation around it the bed can get somewhat chilly since it’s situated right above the main steel frame and behind the front fiberglass cap. We’ve also had some condensation problems in the headboard wall area because of this. Uncomfortable Mattress – The OEM mattress was comfortable for about a nanosecond. We’ve added a pair of foam toppers and it is adequate now. A deluxe mattress is on our upgrade wishlist. Galley Waste Valve – The galley tanks valve handle is located between the tires and under the main slide. A total pain! Noisy Water Pump – The OEM three chamber water pump sounded like a machine gun and gave inconsistent flow to the taps. I’ve replaced it with a better four chamber pump and redesigned the mounting and input and output hoses to quiet things down. Poor Battery Charger – The OEM converter charger did a terrible job at charging the batteries. The noisy, pulsating fan was an annoyance, too. I’ve upgraded to a higher quality converter charger and mounted it right next to the battery bank in the front storage compartment. OEM Tank and Battery Level Monitors – I call them dummy lights. They are next to useless. Why RV manufacturers continue to install these is beyond me. 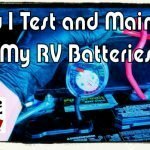 I’ve upgraded to SeeLevel II monitors for my tanks and a Trimetric unit for my batteries. Plastic Kitchen Sink – Nice at first but is slowly getting scratched up and hard to keep clean. An upgrade to stainless is close at hand. Difficult to Clean Space – There is an annoyingly hard to clean space between our shower stall and the armoire. No Night Table – The way the bed is situated there was nowhere to put Anne’s night time glass of water. I added a cup holder for her. Poorly insulated – Even though they boast of having the “Polar Package” the Cougar isn’t that well insulated. The furnace runs a ton on a cold night, and the single AC 13.5K BTU AC unit has a hard time keeping the rig cool once the outside temps get above 85F degrees. 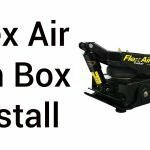 Front Landing Jack Gear Box – The landing jack motor gearbox failed. A small plastic tab broke off. I replaced it with an aluminum cased part as an upgrade. Front Power Landing Jacks – The passenger side landing leg developed a striped collar nut rendering it useless. I ended up going ahead and replacing both at the same time. Refrigerator Electrical Element – Fridge stopped working on electricity when the 375-watt element burnt out. Refrigerator Cooling Unit – Cooling units pipes ruptured, and ammonia leaked out. New replacement fridge was required. Water Heater Electric Switch – Water heater quit working in electric mode when the on/off switch contacts arced and melted the switch. Water Heater Tank – Factory defective weld on the burner chambers metal baffle caused the tank to perorate. New water heater was required. Black Tank Waste Valve – The waste valves plastic body cracked and needed replacing. Shower Faucet – Multi-turn cold knob became flaky to operate. Replaced entire unit with a preferred 1/4 turn type. Shower Drain – Shower drain leaked into basement compartment. Repaired with plumbers putty. 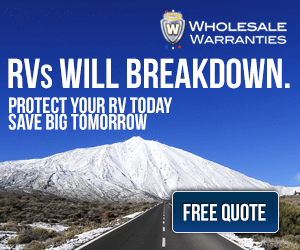 Trailer Running Lights – Intermittent operation and fuse blowing in the truck. Found and repaired pinched wires in front frame area. Rear Ladder – Constantly have to replace cracked ladder rung ends. LP Gas Tank Pigtail Hose – Pigtail hose failed, a funky safety valve. Replaced both pigtails, the regulator and the switch over valve with higher quilty Marshall equipment. Entrance Stairs – Left side failed at the front attachment point, cracked metal. Modded the stairs with an extra bolt, beefing them up, making them stronger. Cabinet Doors, Drawer Sliders, and Blind String Anchors – Most suffer from undersized screws leading to things falling off with stripped screw holes. Added large screws with thicker threads. 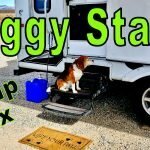 Suspension Equalizers, Shackles, and Bushings – Started to squeak badly. All parts needed replacement after the five-year mark. I have to say overall I feel we’ve gotten our money’s worth out of the 2011 Cougar. We paid approximately 30,000 Canadian dollars for it. In that price range, I believe it holds up pretty well when stacked against competitors. Being aimed more at the weekend, summer holiday crowd and not billed as a fulltime RVer rig I’m impressed with its durability. Most of the failures requiring repair happen even to the higher end trailers. As long as the structure remains sound and we don’t develop any major leaks leading to rot, I can see ourselves living in our Cougar home for many more years to come.